During Zhan Zhuang we experience many different types of ‘organic sensations.’ These sensations or feelings reflect the diverse changes and adjustments the body goes through on the way to refining our Zhong Ding and eventually achieving Song. These organic sensations many times preoccupy the new student throughout the first several years of training. These sensations are often so powerful they drown out our ability to maintain the unified focus of our feeling-awareness in our low Dan Tien. After this transition begins to occur we slowly find ourselves dwelling in this new arena for longer and longer periods. At first we feel both a physical element and an energetic one simultaneously. However, as our training progresses we are able to shift and hold more and more of our feeling awareness solely in the energetic arena. When this happens we find ourselves in a whole new world of possibilities. 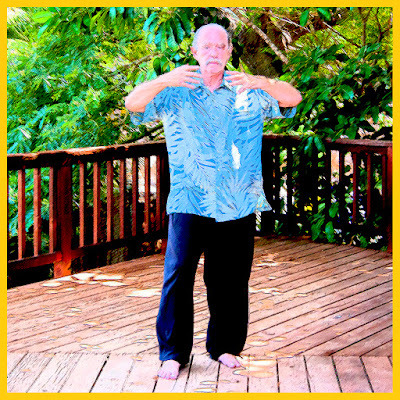 When asked what he felt while doing Zhan Zhuang, Master Cai Songfang replied, “I feel my energy.” Master Cai’s teacher learned Zhan Zhuang from Yang Cheng Fu and was one of only about a half-a-dozen people to whom Master Yang taught this skill. In his younger days Master Cai was the push-hands champion of Shanghai. His daily Zhan Zhuang training consisted of 90 minutes per session in the Wuji posture. Although these energetic feelings or sensations vary according to the individual consciousness and are at best, difficult to translate into words, there are a few commonalities that may prove useful in identifying when this transition begins to occur. One thing that happens is that we feel like our whole body is immersed in a watery-like substance. Although this feeling is a bit more subtle and somewhat different than pure physical sensation, there is a clear and definite substantiality to it. Following this, in the next stage the body’s interior seems to ‘hollow out,’ or loose its feeling of density, all while the sensation of the ‘exterior’ part of the body being ‘immersed in water’ remains present. After this, and often quite rapidly, the deep Central Channel and many times the Left and Right Qigong Channels ‘appear’ or emerge. This is often followed by the Du and Ren meridians opening and linking to this inner architecture such that we can ‘see’ and feel energy simultaneously coursing through all of these conduits while still being peripherally aware of our body’s exterior ‘immersed in water.’ I’ve used the word ‘appear’ to describe the feeling of something manifesting out of apparently nothing. Of course this probably has more to do with a shift or expansion in our perception. 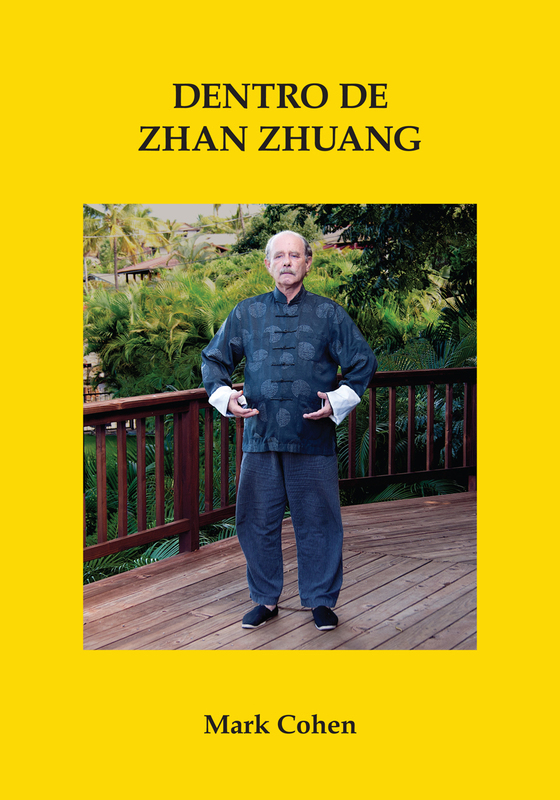 Inside Zhan Zhuang is now available as an ebook en Español! One of the benefits of daily Zhan Zhuang training for martial arts is the ability to emit strong power in a very short space or distance. The whole-body force happens ‘under the skin’ and only manifests visibly in the wrist and hand. Being a Taiji style punch, the energy begins in the low Dan Tien, instantly travels under the feet, up the spine and Central Channel and out the fist. Although the video examples are self explanatory, a few words will perhaps be useful about how to receive the blows. Many people have not been struck by a strong internal power blow to their torso, head or neck. Those who have, have no desire to repeat the experience because these types of strikes very often linger (create pain or other serious problems) for hours, days and even weeks after the actual blow. In one case a famous internal martial arts master struck one of my teachers on the shoulder-blade. The strike itself took only a few nano-seconds to deliver, but my teacher suffered serious pain for several months afterward and needed acupuncture and massage to finally clear it. With that in mind, a method was developed which allows the repeated issuing of strong internal force without damaging the recipient. Firstly, the blow is delivered to the opponent’s arms rather than their torso, head or neck. This allows the force to be transferred to our feet while keeping our structure in tact. The additional force is then absorbed by allowing ourselves to be ‘bounced’ away, bouncing repeatedly if necessary, each time landing firmly on our heels to vent the excessive Qi out of the body. This bouncing back also allows the recipient to fully maintain their structure or frame while receiving the blow. This way we can practice repeatedly with strong internal power and no damage to the one absorbing the hits. A word to the wise, not following this method or something similar while repeatedly issuing strong internal power will inevitably result in either the recipient’s frame being disintegrated - causing instant and perhaps lasting damage - or at the very least, roughly and unceremoniously losing balance and landing hard on their backside - or both. Slow Frame testing, sometimes called Spring Testing, is a basic two-person exercise designed to give experience in the compression and expansion of the joints and cavities and cultivate and strengthen the outer physical frame and the idea of spherical movement. Simply put, one training partner assumes a Tai Chi (or Zhan Zhuang) posture. The other partner then gradually applies pressure (force) while the partner in the Tai Chi posture systematically absorbs the force into the low Dan Tien. At first a technique called “Snaking” (like the undulation of a snake) is used where the force is absorbed step-by-step through each of the joints and cavities. In the first example in the video, fists are used to apply force to the palms of the Tai Chi posture “An.” (Push). As force is slowly applied, the palms and wrists gently compress followed by the elbow joints, the shoulder joints, shoulder blades and shoulder’s nests and finally the spine. As the partner’s pressure continues, the spine, chest and abdominal cavities also gently compress or condense, taking the force down into the hips, Kua and low Dan Tien region. From there as your partner’s pressure continues, you next compress the feet, ankles, knees and hips into the Kua and low Dan Tien. This in effect creates a compressed version of an energetic sphere with the low Dan Tien as it’s centerpoint. 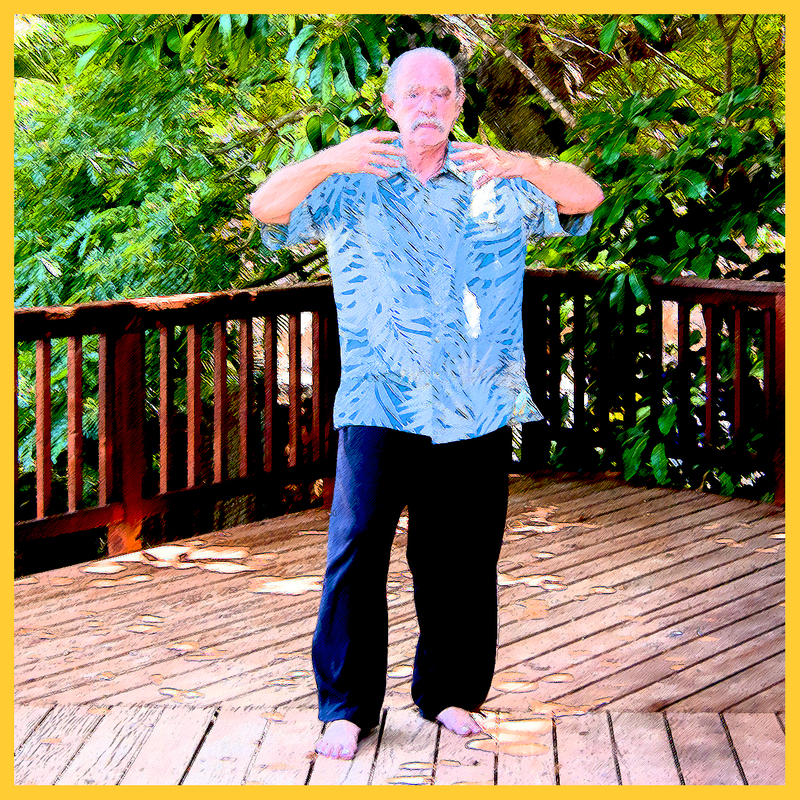 From there, with the body having properly absorbed the force into the low Dan Tien (and feet) the partner in the Tai Chi posture achieves a moment of ‘stillness’ and then - in one instantaneous movement of release - using relaxation, suddenly drops the Qi (pressure) down under the feet. This instantly generates power which rises up the spine and out the hands, creating in effect, an expanded Sphere. Once this basic method has been mastered in sequence through the segmented or “Snaking” method, the next step becomes condensing and expanding the joints, cavities and spine simultaneously. Following that, once one has achieved Song, then at first touch the practitioner’s energy automatically sinks to the low Dan Tien and below the feet. This is accompanied by a condensation or compression of one’s Qi or Inner Frame or Sphere. At this stage, issuing Jin is then only a matter of expanding one’s Inner Frame or Sphere. Thus the advanced practitioner shows very little outer movement if any, while the recipient is strongly and sometimes violently repulsed or ejected.